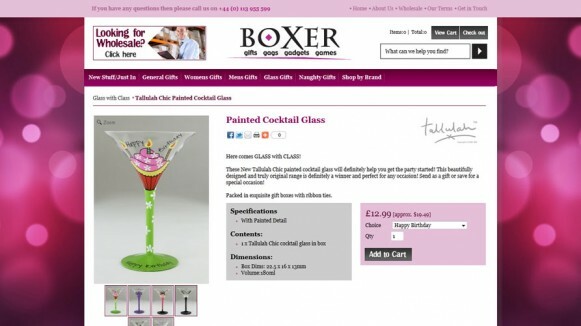 Established since 1982 Boxer Gifts are designers, innovators, creators, and manufacturers of unique, original and quality gift ideas. They offer a wide variety of products which will make people laugh and definitely remember! 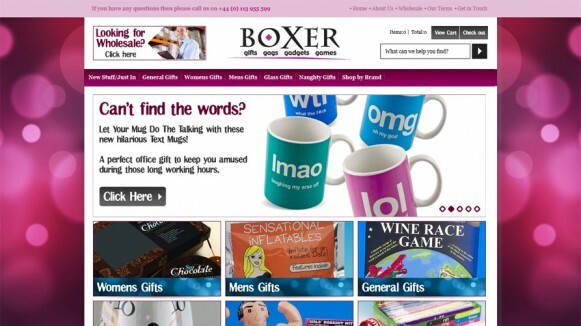 Boxer Gifts are a specialist distributor within the UK and Ireland who supply to department stores, multiples, mail order companies, garden centres, card shops, websites and many independent retailers. They are importers, but still manage to manufacture a good percentage of their products within the UK. Their mission is to continually provide new and innovative products for the gift market. Boxer Gifts constantly develop new products and ideas all the time so watch this space for the next best sellers to hit the high street! Centurius were recently commissioned to redesign and redevelop Boxer Gifts new ecommerce web site from their existing version 8 multi-user software to the current version of the Actinic Business Ecommerce (V11). From initial meetings with our client, it was agreed that the new look of the website required a more minimalistic approach, with clear navigation areas, nice clear advertisement areas and enhanced site functionality to encourage customer purchasing. The main homepage required a redesign to allow for larger adverts, as well as introducing a multi tab best sellers, new arrivals and staff choices. Due to the variety of product types it was important that multiple product layouts be created to accommodate for the diversity of the ranges. The corporate colour palette was also essential to incorporate into the design for brand representation. Regarding the design layout of the site, we felt that an increase in width to accommodate for more product real estate was essential. Elements from the first generation such as the general enquiry/ wholesale contact forms needed to be kept as did a health & safety over 18 pop-up warning box, depending on which area of the site the customer may be in. A new mega menu system (standard in V11) was also introduced within the template replacing the existing left hand navigation layout. 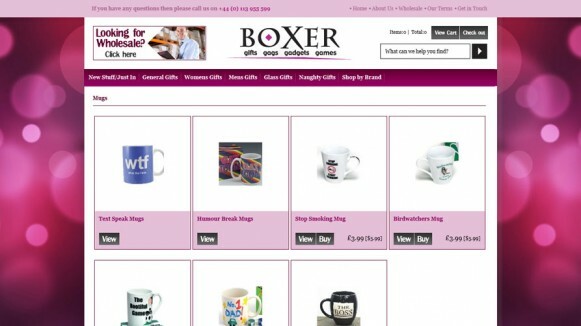 This allowed a restructure of the site to be achieved allowing the Boxer Gift product range to be re-categorised into six top level sections. The introduction of JQuery was introduced into the new homepage to allow the client to add multiple rotating adverts which also link to specific parts of the web site. A number of external plugins were integrated into the site to entice the customer into purchasing products, such as an automatic zoom magnifier which shows the product in far more detail. This function was also able to work with the fragment image templates. Centurius also created the ability to easy add a YouTube video to a product by simply entering the YouTube generated embed code. When clicked the video appears over the top of the site.